Rami was first introduced to Richie through friends while they were in college. Prior to meeting Rich, Rami had no knowledge of Friedreich's Ataxia. 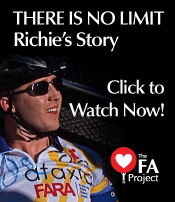 Upon learning more about the disease and growing to know Richie and his inspirational story, Rami felt compelled to assist others who are dealing with this disease. He is a graduate of University of Massachusetts-Isenberg School of Management and has been a CFA Charter holder since 2006. He is currently a Director of Finance for Bain Capital Private Equity, where he has worked since 2003. Rami spends his free time fishing at his family's vacation home in Rhode Island where he is always eager to show his friends and family to a good time filled with laughter. The FA Project is extremely grateful for Rami's efforts not only from a finance and legal perspective but also for playing a major role in our organization's creation. Feel free to contact him directly anytime at rami@TheFAProject.org.